Yay, my little knitting party came off! 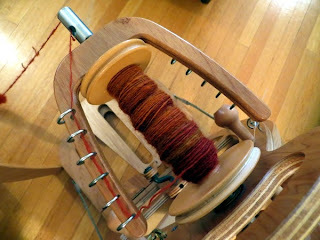 Trish and Jennifer came over to knit, and I got out my spinning wheel for the first time since the Tour de Fleece ended in July. ahhhh, look at that gorgeous clean uncluttered floor. And look at how much spinning I got done! This is the last bump of fiber I wanted to spin into sock yarn, and none too soon because my next opportunity to buy more of this stuff is in about 10 days. I mean, how can I justify buying more if I still have some on the wheel, right? 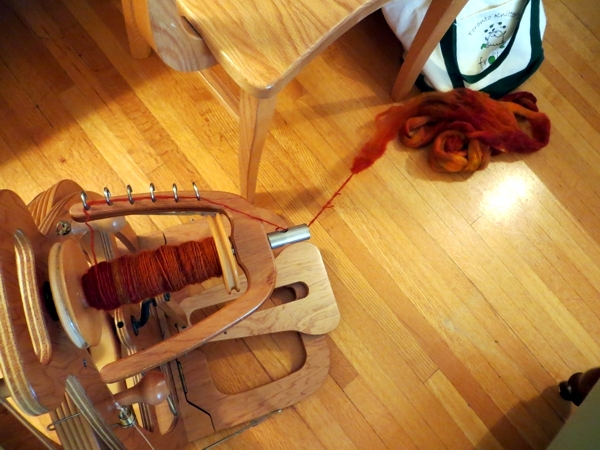 So I'm pretty motivated to get this (and its two companions) spun and off the wheel so I can ply. Afterward I got onto the Toronto Public Library site to look into its partnership with Zinio; it's just crazy how many digital magazines you can read for free through the library on your laptop, including Piecework, Knitscene, and Interweave Knits. Wowza: thanks for the heads-up Trish! Sadly I can't read any of them on my new tablet, because Adobe has decided not to support Flash for mobile devices as of two weeks before I bought said tablet. Apparently there are apps that sub in for Flash, but I tried one and couldn't get it to show me more than the cover of Piecework. So: if you happen to use a workaround that does work, feel free to let me know: I'll just be in the salt mines, ready to drop everything for a good read. Either way, have a marvelous day and I'll be back here not at all bright or early tomorrow. Take care! There is a work around for that that involves downloading and installing apps like easy installer,es file explorer,an alternate browser such as dolphin(or opera or foxfire)and Adobe flash player app.I haven't done it yet on my kindle fire HD,but I know it works from the help forums on Amazon.is there some kind of user forum for the tablet that you bought where you could find some guidance specific to your device? Good luck!